People on the receiving end of a storefront crash — whether or not they're actually injured — describe strikingly similar emotions afterward. These two examples from August 2012 crash scenes provide good insight into what people go through. While I don't like to dwell on psychological trauma, per se, reminders about the true impact of these crashes help us all remember there's more at stake than some broken windows. 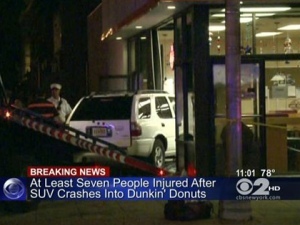 In a Jersey City, New Jersey, crash, a 55-year-old drunk driver slammed into a Dunkin' Donuts August 13, 2012 (see details via CBS2 New York). One of the eight people injured recalled her fear for CBS2 the next day: "I thought that was it for me...Not only me, but the other people. I thought, ‘That’s it.’ I still haven’t slept, I’m still awake. I see the vehicle, I see the glass, I see everything now." 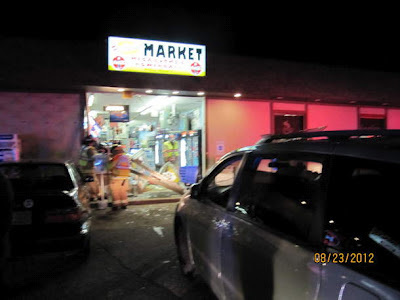 In New York City's Hudson neighborhood, a 17-year-old driver crashed a minivan into Palmer Market August 23, 2012 — luckily not injuring the store clerk but leaving her shocked and exasperated, not only by the crash but by the kid's nonchalant attitude immediately afterward. She tells the story best herself, in this NashuaTelegraph video.